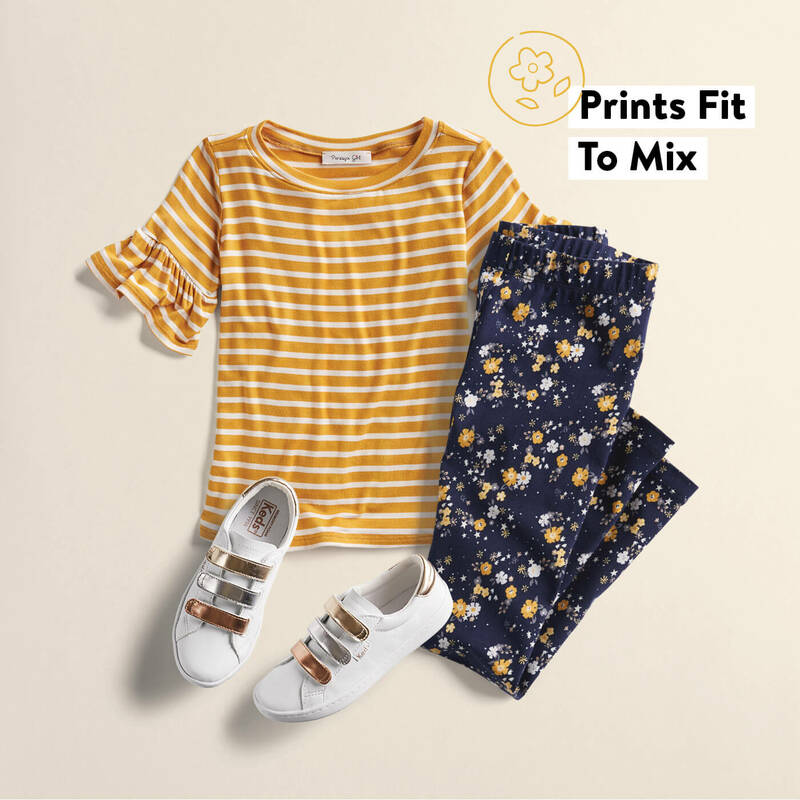 Pants are a key wardrobe staple in every closet, for both boys and girls, and the styles available in a Kids Fix are far beyond basic jeans or sweats. 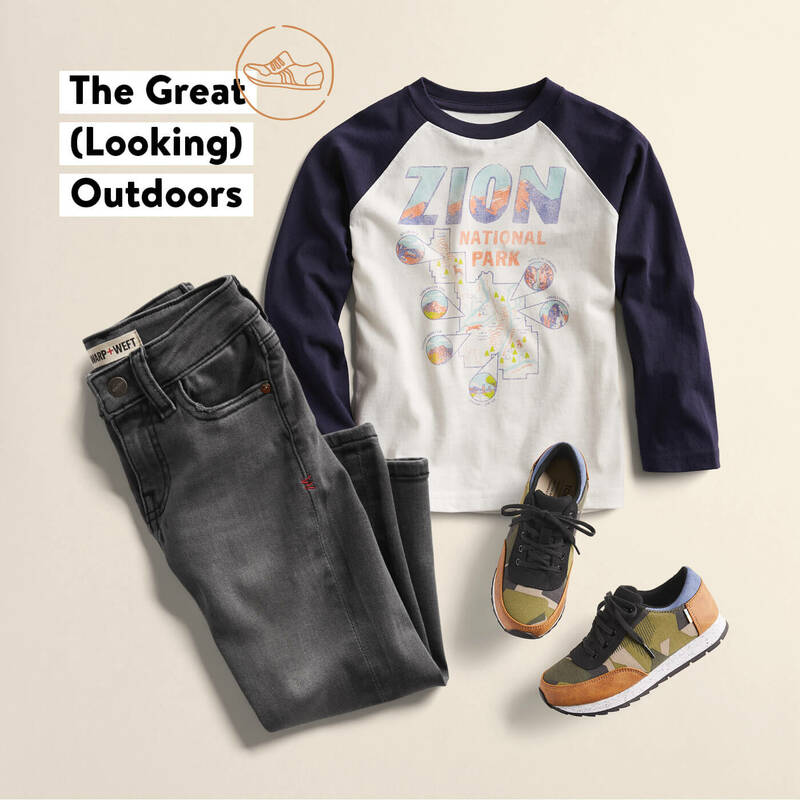 A great pair of pants is not only functional but are the foundation for fun looks that your kids will love to wear and you’ll love to see them in. Check out our suggestions for how to style a wide range of Kids pants, then schedule a Kids Fix and let the fun begin! Floral pants might not seem super versatile at first glance, but when styled with a striped top within the same color pallette, they really shine. And speaking of shine, metallic fasteners on these white sneakers add just the touch of glam your girl might love. They’re perfect for school and weekend activities alike. These pants could also be worn with a ruffled blouse and patent shoes for more formal occasions. How to elevate the ubiquitous graphic tee? Pair it with some drawstring pants in a not-too-boring color. We think he’ll love the outdoorsy feel of this outfit, even if he’s stuck inside working on multiplication tables. When paired with some comfy sneakers, this outfit will be ready for recess at a moment’s notice. The pants also play nicely with a button down shirt for a look that’s a bit more dressed up. 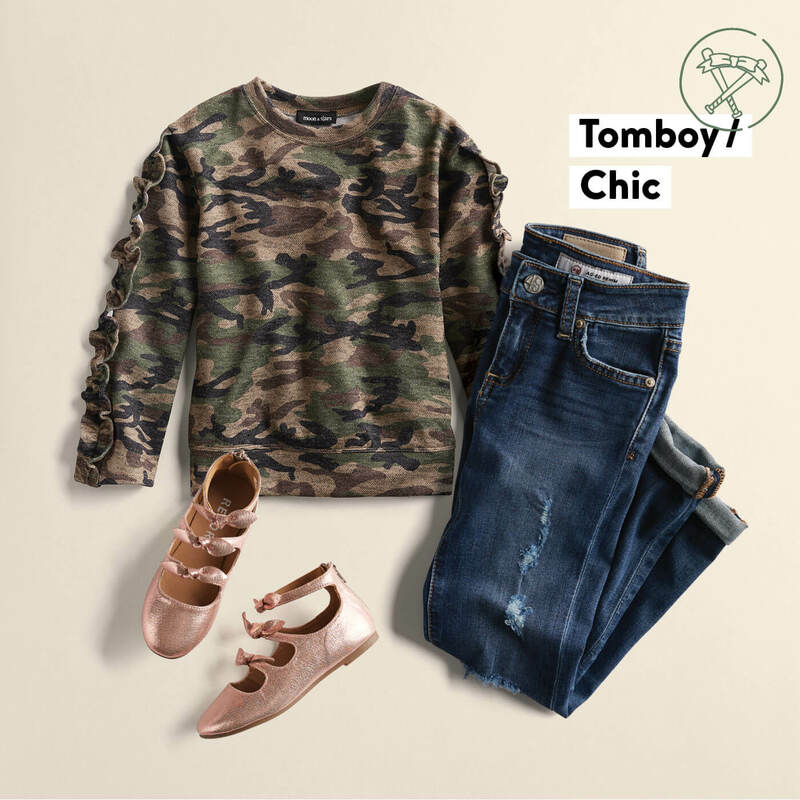 Jeans with a bit of distressing are all the rage—now glam them up with a right-on-trend camo top (don’t forget the frills!) and some too-cute strappy mary janes in her favorite rose gold. This look comes together in the details. Any girl who likes her outfits on the dressier side will love wearing this, and the jeans are totally dress-down-able, too—just pair them with a graphic tee and sneakers for a more casual look. Faded and soft black jeans are a boys’ wardrobe workhorse—they look great with so many different types of shirts. 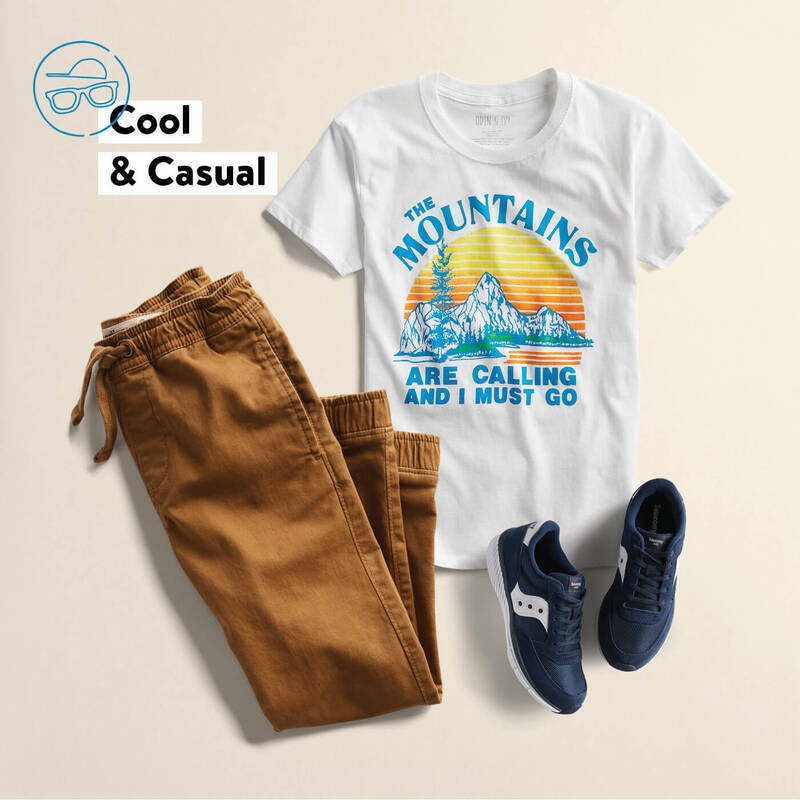 For a throwback to summer vacay, pair them with a souvenir-type tee and sneakers with a touch of camo—it’s comfy, fun and just may inspire a little adventure. We love the jeans with a chunky sweater for cooler days, too. Ready to surprise your kid with cool new pants? Schedule a kid’s Fix today! Good style now runs in the family! Every Fix includes 8-12 pieces, in sizes ranging from 2T-14—hand-picked for your child with prices ranging from $10-35.